Manufacturing has experienced dramatic structural change and economic shocks in Zimbabwe. Zimbabwean formal and informal manufacturing firms operate in an environment of economic volatility and policy uncertainty. The challenges to growth and recovery are severe and require rigorous economic analysis drawing on a detailed understanding of the field and relevant high-quality data. 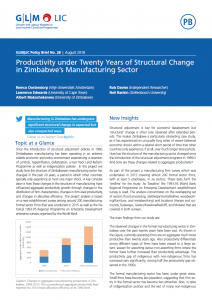 Two policy briefs from the GLM|LIC programme shed light on wages and structural change in Zimbabwe’s manufacturing sector to better understand firm-employment dynamics. The first policy brief by Neil Rankin (Stellenbosch University) et al. examines how workers in the manufacturing sector are affected by challenges faced with the firms they work in. It discusses the reasons why workers may not leave their work even though they are not being paid full salary. The second policy brief by Remco Oostendorp (Vrije Universiteit Amsterdam) et al. studies how the structure of the manufacturing sector in Zimbabwe has changed over the past 20 years, a period with unusually long series of severe (adverse) economic shocks. A key consider­ation is how these changes in the structure of the manufacturing sector have influenced aggregate productivity growth through changes in the distribution of firm characteristics, changes in firm-level productivity, and changes in allocative efficiency. Read more in GLM|LIC Policy Brief No.27 written by Neil Rankin et al. and Policy Brief No.28 written by Remco Oostendorp et al.